Summer’s finally here! The longer days, the quality of light and the warmer temps inspire change. Just like we change out our sweaters and boots for tee shirts and sandals, we also feel the urge to lighten up our home. 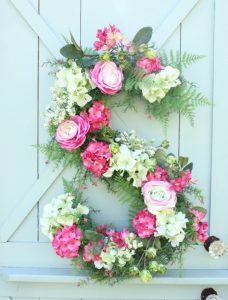 Whether the focus is enjoying your time outdoors or bringing the outside in, AHRN.com offers ideas and DIY projects to get your place in super summer shape! Let’s start first with the outdoors – from your front door/porch decor to the back patio or deck and garden. You don’t have to wait for Halloween or the Winter holidays – your front door and landing can be decorated for summer too! There are so many ways to make a wreath – simple or sumptuous, natural, flowery, rustic, or with lights. 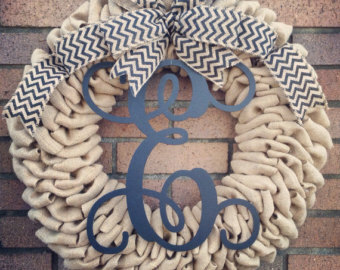 More and more we’re seeing wreaths incorporating monograms. Here’s a unique one. Directions found on Daisymaebelle.com. For those who prefer a more natural look, burlap and other natural fiber wreaths are quite handsome. Order the one below from MakingaMesh on Etsy or make it yourself. There are lots of great ideas on Etsy! It’s easy enough to find how-to’s by Googling. Search Pinterest for inspiration! 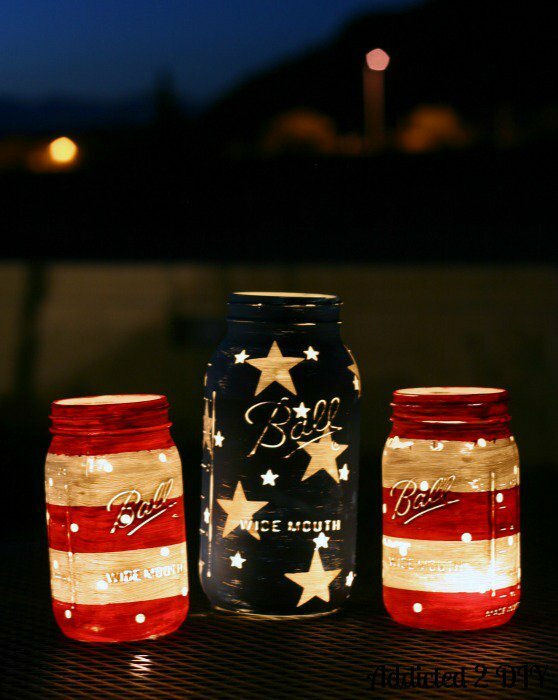 This is easy to DIY if you’re not finding what you like in the stores. You can use spray paint, but check out abeautifulmess.com, which has an easier and more durable version. Whether it’s in the front or the back, on the lawn or a deck, making your outdoor space inviting will bring many rewards. Because patio furniture is neutral, you can freely change your color palates, trying combinations you might not use inside the house. Cushions, umbrellas, tents, etc. can be found everywhere from big box stores to Home Depot/Lowes. How about going citrus – lime green, yellow and mango, in bold solids or stripes? Or go Tiki themed, vintage Hawaiian, 50’s style, or rustic chic and reflect it in your cushion fabric and lighting choices. A fast, inexpensive, easy way to add pop and pizzazz! Don’t worry if you can’t paint this perfectly; it will just look distressed and antiqued! Bandanas come in every color these days, including the trendy neon, so pick what goes with your party or patio cushions and have fun making something this easy! 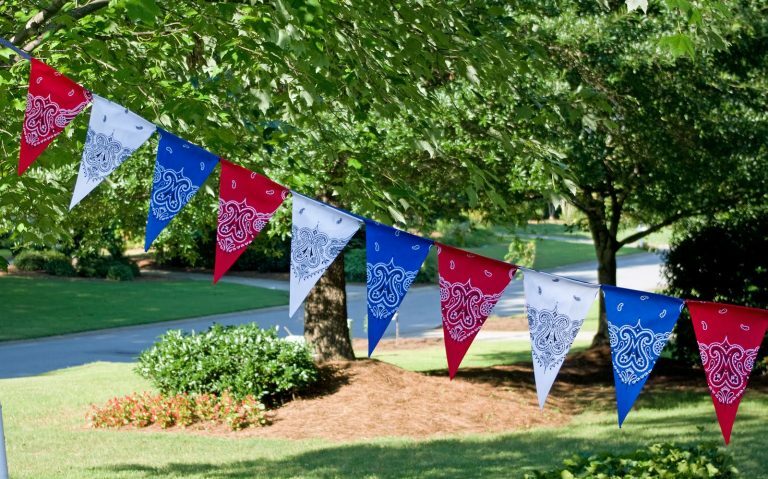 Check out these outdoor bandana banners by HattererandHareevents.com. 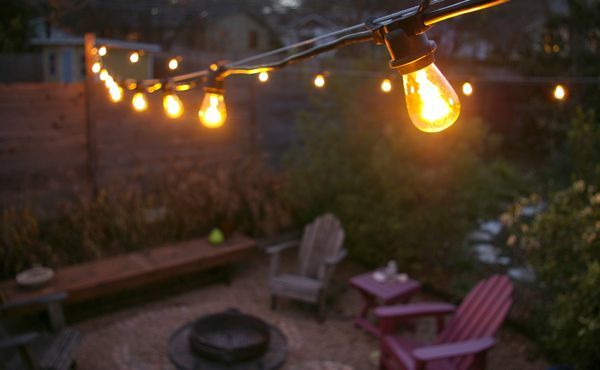 String lights add romance and character to any outdoor setting – or any indoor one at that. Repurposing your Christmas lights will do, but there are also the bigger bulbed ones that are specifically used for outdoors. Back in vogue are the old-time incandescent bulbs, which you can find at Lowes, Home Depot and specialty garden stores. OOGA.com has a wonderful selection of all kinds. Find these under the incandescent string kits menu. Love these! Addicted to DIY.com has simple directions. Paint them in any color, or with starfish, guitars, wildflowers – whatever suits you. 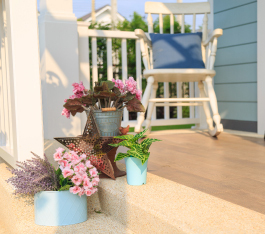 Line the walk or the deck or arrange them around a cluster of containers on a patio. If there are any remnants from the winter or holidays, take a morning to stash them. That in itself will feel like a new beginning! 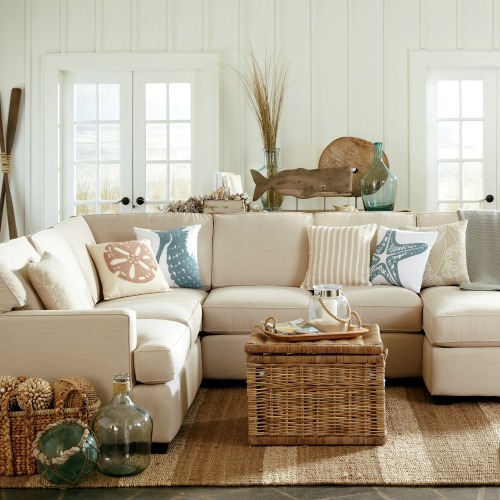 Then, change out the thick throws on the couch and add light colored pillows, choosing bright colors or patterns with a summer themes. (Think floral, beachy, patriotic or nature.) 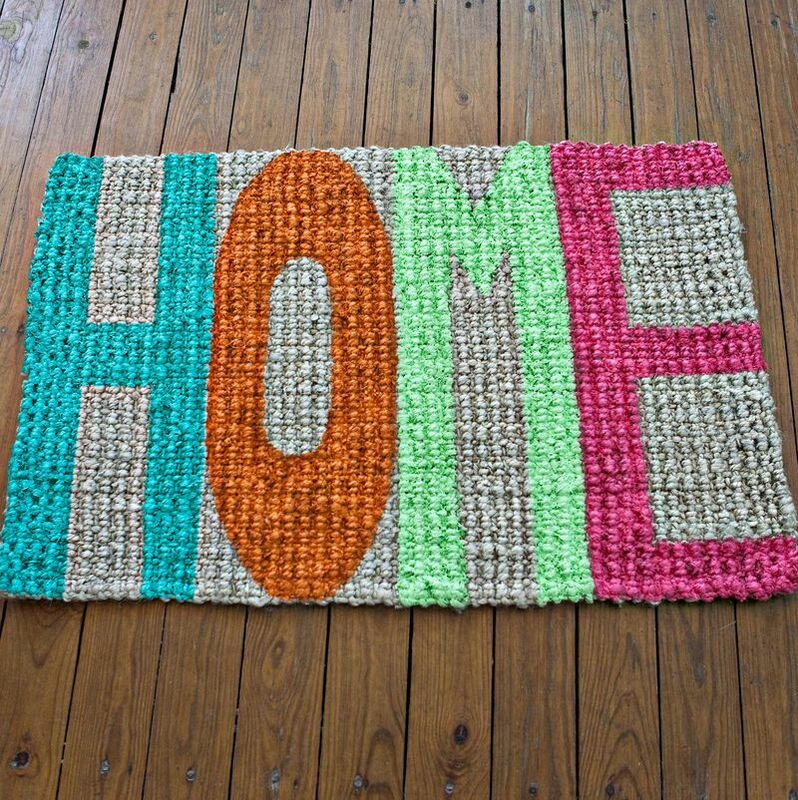 Lay down a sisal rug (even over heavy carpet), which lightens up a room. Add navys, whites and natural fibers. Or choose floral with roses, lilacs or peony patterns. How about pastels to create a shabby chic or rustic look? The possibilities are endless. Don’t forget to dress the mantle. String banners to brighten any area and add texture. Hang DIY art in the entrance way. 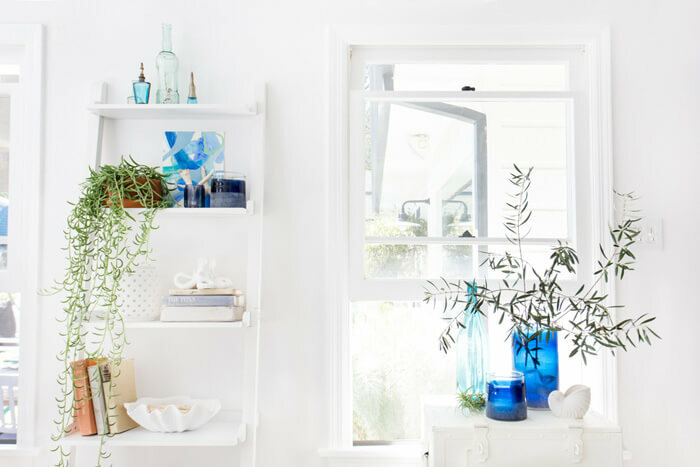 Or arrange a cluster of vases, shells, plants and/or decorative tchotchkes you love on a prominent table, the stair landing, a corner, or dotting shelves. 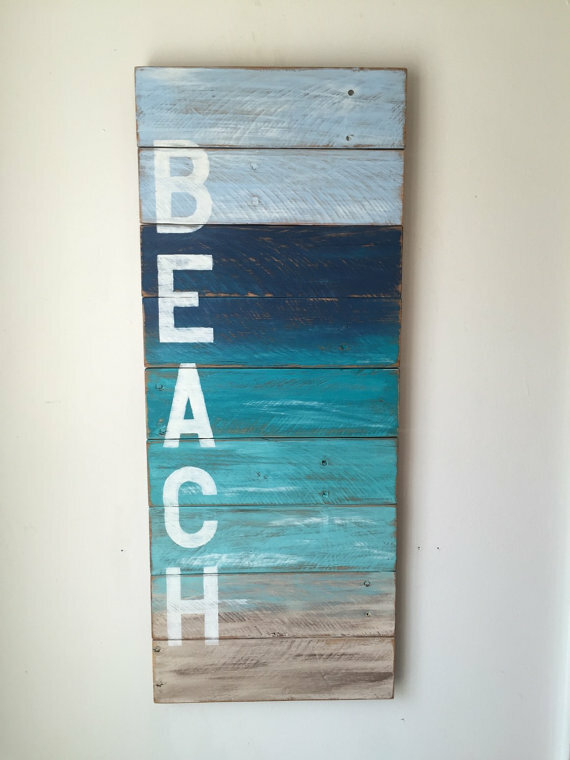 Repurpose driftwood and choose ocean colors to make something for the walls – or you can buy something perfect like this on shoponelove on Etsy. 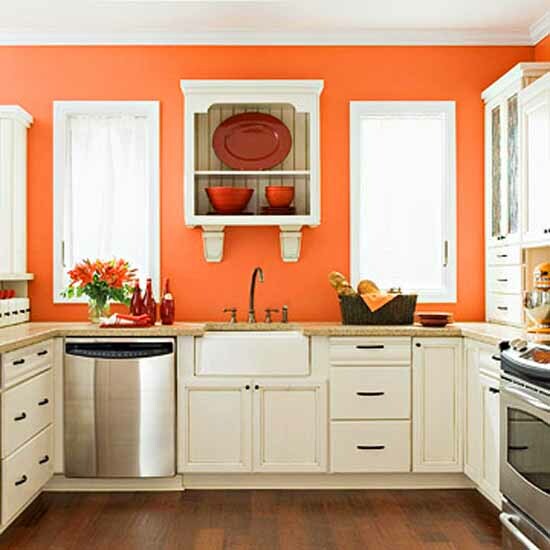 You can easily breath fresh life into kitchen décor simply and with little cost. This is a good time to toss those old dishtowels, tired area floor mats and half burnt pot holders and pick up some nice new ones. From cruets, to utensils, to cloth – anything’s an opportunity to brighten up the space. You can also “decorate” with colorful bowls on the counter, holding fresh, colorful fruits. 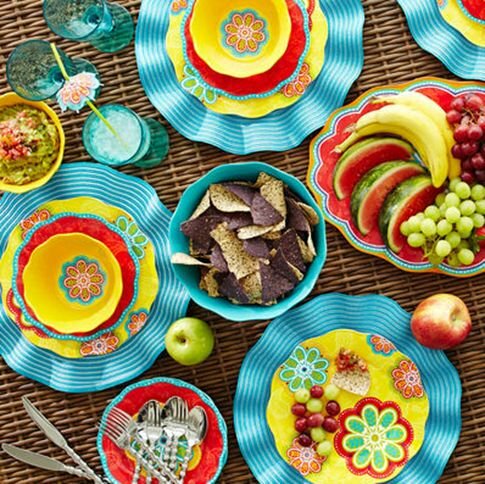 Search thrift stores, garage sales or places like Tuesday Morning for a fun, colorful bowl. Or just paint an accent wall and look what happens! Pull out (or buy) the plastic plates, bowls and glasses that you use for picnics or on the patio so they’re in easy reach. New Lucite glasses in blues or greens or fun shapes for cocktails are just the thing to perk you up! Make or buy placemats, a table cloth, or even add cushions to your bar stools. It all says summer fun! Change sheets from the cozy flannel to crisp cotton. Keeping them to 200-300 thread count keeps them light and cool. Put those bulky comforters in one of those vacuum space saver bags and stow away for colder weather! You can pick up light woven blankets to feel some cozy weight while you sleep without adding warmth. Or go with brightly colored, striped or floral coverlets. 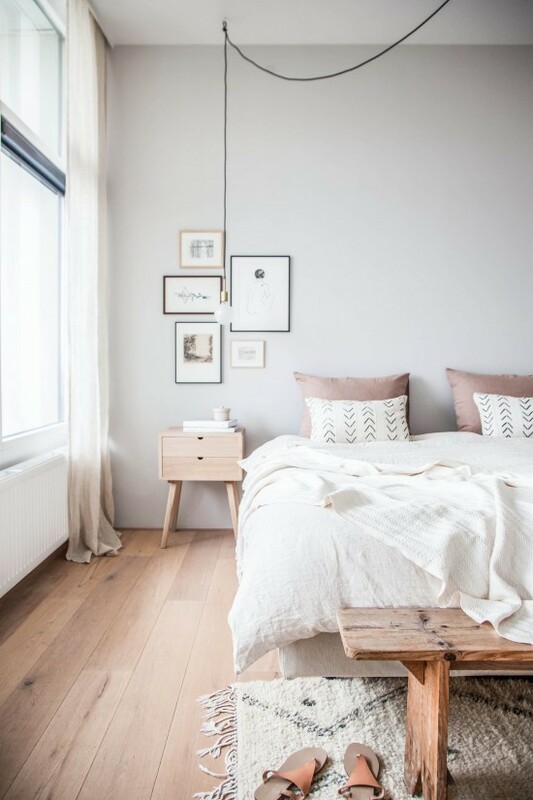 Whether you have carpet or a wood floor, get a summery throw rug to put under the foot of the bed (as seen above) or wherever it works best to add a little jazz and light without a big cost. 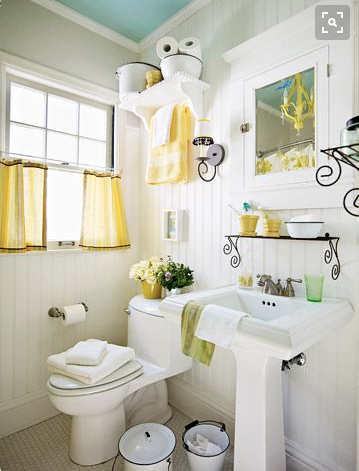 Bathrooms are easy to spruce up because they are small. Adding something new can freshen the whole room. 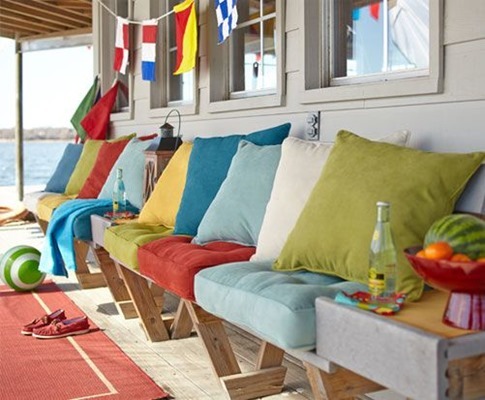 Swap out the bathmats and towels with new ones in bright, summer colors. You can also make a little arrangement of shells, bring in a vase of spring buds you find on a walk (or in your yard), or add a new fragrant hand soap with a nice label or color. Don’t pass up the little spaces that call for a little something fresh and summery. In fact, if this was ALL you did, it would be transformative! Your eye will catch them as you wake up, get dressed, put away laundry, change for the gym, or get ready for sleep. Below is an example of what you can pick up at thrift stores or tag sales or Home Goods and Marshalls, and how it can enhance shelves, stairs, end tables, etc. from Style by Emily Henderson. Those great finds translate into a gorgeous space like this! Don’t underestimate the positive effects of putting wonderful touches everywhere. Rochelle Joseph is a Writer and Image and Marketing Consultant who has had experience marketing, renting, buying and selling her properties for over 20 years. She has written and edited for several publications, including the Boston Book Review, The Emerson Review, ZooBorns.com, WildLife Magazine, the Houston Zoo, The Wildlife Center of Texas, One Spirit Interfaith Seminary as well as AHRN.com. She currently writes at her great gifts blog at Looky Here You and her animal blog at Naturegirrrl.